As mentioned in the post, the schedule is on http://www.characterlocator.com for subscribers. We took our three kids to Hollywood Studios on Sunday and met Pocahontas, Mulan & Mushu, the Evil Queen, Aladdin, Tiana, Pinnochio and Stitch. Soooooo glad the Mom’s Panel at the Disney website recommended your site. Thank you so much- we had a wonderful experience! Well, that’s cool. Didn’t know the Mom’s panel recommended me! Thanks! Great pics. Thank you, as always, for the information. Had the pleasure to meet you at the special Unleash the Villans party. We are visiting now, but missed the Palooza yesterday. Will try to get to it Thursday hopefully! Thanks Lori. It was great meeting you. I still haven’t posted those photos yet oops. Thanks, I didn’t revisit the calendar from when I made my spreadsheet a few months ago. I overlooked it. Thank you for redirecting me. We were there on Tuesday the 20th and met Princess Tiana, Genie and Princess Jasmine, Mulan, Mary Poppins and Bert, Pocahontas and Meeko, and Chip and Dale. My kids loved be able to meet so many characters in one place with no lines! Thank you so much for the tips! We never would have know about this! Welcome. Lots of little details on here that most people miss. Is this a daily occurence? Love the site. Thanks for your work. Great story and photos. Hope it stays at the HTOT exit. It’s a great place. Current operational plan is to remain there. It’s easier on the characters. I was the only member of my group who would go to Character Palooza when we went in November 2014. It was like they didn’t believe it would happen. I met: Tiana, Snow White, Pocahantas, Mulan, Mary Poppins, and Stitch. They were all wonderful! It was not crowded and so relaxed! I got to spend a large amount of time with each character. And, since I was alone, there were cast memebers there to take photos with my camera. And the pictures are great. Thank you for one of the best moments of my trip. I’m taking my 81 year old father for this character meet in June. 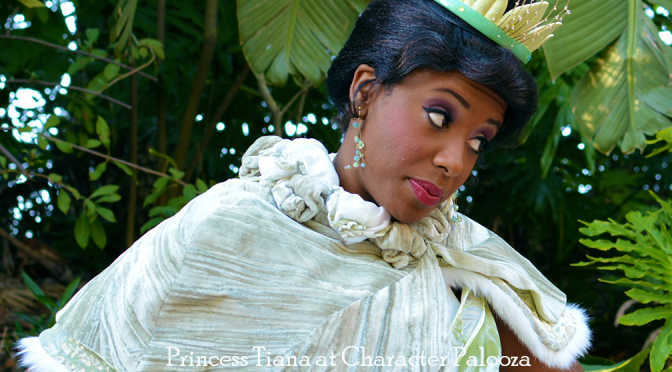 We are going in June and character palooza is in our top 3 things to do. We missed it last June. Thanks for info. I check your site almost every day. So awesome! Thanks to your info we were able to experience our first palooza in November and my daughter 14, loved it so much. We met the evil queen, gepetto, tiana, briar fox, and several others. We hope to check it out again in April when we return. Thanks for your app and great advice.